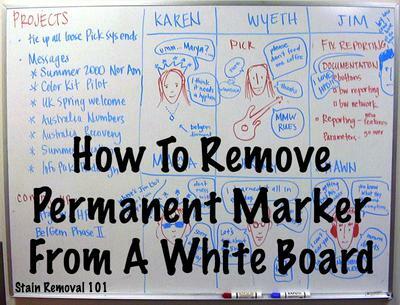 Below is a video showing how to remove permanent marker from a white board. It is easy to grab a permanent marker, on accident, and write on your white board instead of using the dry erase markers it is designed for. Or, as occurred to the man on the video his child got hold of a Sharpie and wrote all over the white board. The video shows a great little tip for easily removing these permanent markers from the white board -- just write over the permanent marker marks with a dry erase marker, and then wipe them both away. It really is a cool tip, and so simple! I love simple solutions to cleaning and stain removal problems! See the video for a full demonstration. You can submit your own tip about how to remove permanent marker from any surface here, or read other tips already submitted. In addition, plastic items like the white board, often get stains and dirt on them. You can share your tips for cleaning plastic here, or read other tips which have already been submitted. I had red permanent marker on my board for a week. I used a pink pencil eraser it left red smudges, so then I used a magic eraser which made a gummy brown stain, so then I used a dry erase board cleaner and a paper towel and applied pressure it worked lol! I use "Goo Gone" to remove permanent marker from whiteboard and from magnetic white surfaces. It works pretty well, unless it's been there too long. It also removes as well as sticky residue left by labels or stickers. Avoid using "Goof Off" on ANY plastic surface, it etches the plastic and destroys the smooth surface! We came to work and saw that workers from Dayshift used permanent marker on the whiteboard! So did some research and we decided to use toothpaste as its the only thing we have with us at work. And to our surprise it works!! Phew. I have had experienced the dreadful "did they really use permanent marker on this?" for the dry erase board at work. I covered it in dry erase marker and it did the trick! They called me magical when they saw the trick! Don't give up hope. I tried the dry erase marker, rubbing alcohol, nail polish remover, Mr. Clean eraser, and hand sanitizer. Nothing was working. Crest toothpaste and an old toothbrush finally worked. My son figured out the a pencil eraser will remove Sharpie marker from a dry erase board. Nail polish remover worked on white board to remove stains of permanent marker. 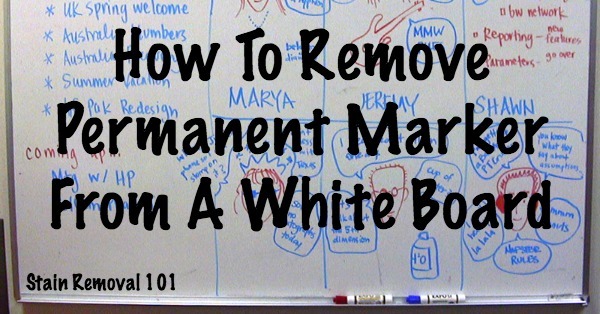 The dry erase marker trick to remove permanent marker works on other surfaces. This week I took my name off of a book I was ready to donate. Maybe mine was on too long before I heard of all these tricks, but none of them work on my daughter's whiteboard. How can we get OLD permanent market off? I've been considering buying whiteboard paint, but it's expensive. Use a dry wipe pen to scribble over the mark and wipe it quickly. Best not to use black because it can be hard to wipe away completely. First, get a white board or dry erase marker. Write directly over the permanent marker lines. As it dries, wipe w/a cloth. If residue or color is left, use *91%* rubbing alcohol, not 70%. The more powerful 91% breaks the chemical bonds. It's one of the first things I tell a rookie teacher. Hand sanitizer on a rag or paper towel works, too. I rub the board with boiling hot water. Try fingernail polish remover. Works like a charm and it's fast and easy. I dampen a cotton ball in nail polish remover and erase the permanent marker on the white board.... Voila !!!! Expo white board spray and a rag removes permanent marker as well. Toothpaste cleaned a white board for me last week! I have a white board and my kids do this all the time. I use lemon oil and it comes right off, no hard scrubbing, it just wipes off. dry erase markers do work! I have a white board that I use as a monthly calendar and I use permanent marker to make the grid and number the days of the month and then I use this trick to erase it. I have a wide tip dry erase that I use exclusively for erasing the sharpie. Love it. 91% rubbing alcohol cleans the whole board... No problem. Hand sanitizer works. Basically the alcohol but thicker and easier to work with. Nail polish remover works perfectly! I did this at school last week. Grabbed the hand sanitizer and it came right off! Rubbing alcohol takes it right off! Yep, Magic Eraser or glass cooktop cleaner works great too. Cooktop cleaner makes an awesome dry erase cleaner. Mr. Clean magic erasers take it off. When I was a new teacher I accidentally wrote the entire day's assignments on the white board in sharpie marker...for grades K-5!!! I went to the janitor in a bit of a panic. He calmed me down, showed me this trick and helped me get it all back to rights. Huh, interesting tip. I wonder why it works? Do you know? Join in and write your own page! It's easy to do. How? Simply click here to return to permanent marker stains.